We’re not big alcohol drinkers, but we had a celebration that landed us with a few more bottles than we’re used too. 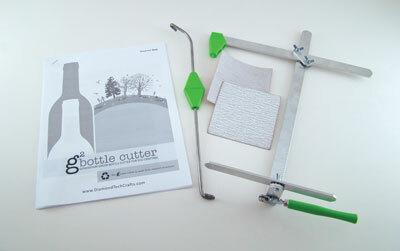 So basically, after a few fails I bought the featured glass cutter above. Fancy cutting gadget that enables to do do this alone. Once it’s put together and you get the concept, it’s easy. Score the bottle where your desired cut is to be. It will sound like fabric tearing as you cut, if you’re doing it correctly. Don’t over cut, once around. Have a way of pouring hot water from the boil on the fracture cut you made, You want to get it just on the fracture as much as possible, in other words don’t heat the whole bottle. Then quickly run the fracture under cold water. As the bottle begins to break, you will see a change in the light at the fracture. Continue on with this heat and cold cycle until the bottom or whatever you’re cutting falls free. Warning, this scares me every time, the first few times I actually let out a quick shriek. It has a break away pop noise then falls to the bottom of the sink. Once the bottle is cut, I took denim strips I cut from old jeans and fed them through the neck to the inside of the bottle, and tied the ends to metal washers that were bigger than the bottle neck so they wouldn’t fall out. 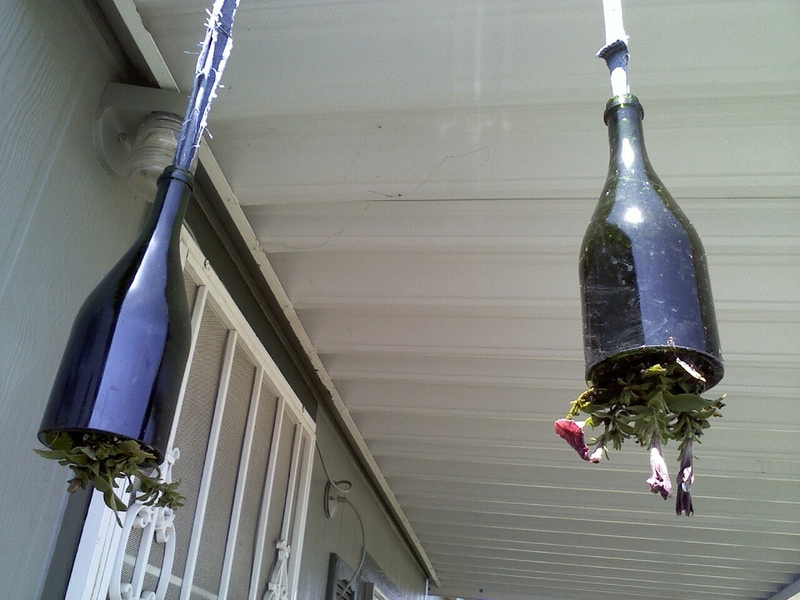 I filled with soil and my chosen plant and then hung. Watering required it to be taken down and turned or through the neck VERY slowly. These made some great gifts too.